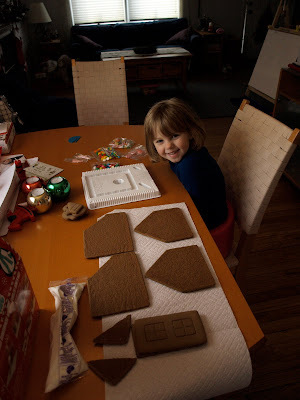 First off... someone should have reminded me that putting together a gingerbread house is no simple task. There should be a warning on the box or something. "Do not attempt to build this house unless you want to be highly agitated and aggravated. Attempting to build this house WILL cause stress, tension, crying and cursing." 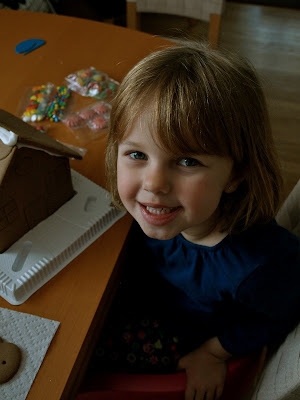 But, Zoe was beyond thrilled to put together and decorate her gingerbread house. She was slightly upset when we found out the 2 roof pieces had cracked. But I promised I could fix them and I let her eat a decoration gumball and all was fine. With a little (LOT) of effort I was able to get that house together and standing up straight. Zoe VERY patiently waited for the icing/glue to dry. Even after the suggested 10-15 minutes of setting time (we waited 20 even) that house didn't want to stay up straight. It kept drooping at the roof peak. I ended up covered up to the wrists in paste, er, icing. It is very hard not to lick your fingers when they are covered with what looks like yummy icing. Let me tell you... that icing is not yummy. But Zoe... she stayed smiley. 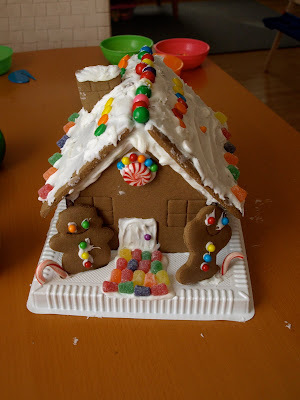 We did eventually get the house to stay together while we smooshed each piece of candy into place. Putting those gumballs on top cause it to collapse more than once. I warned Zoe multiple times that we might not end up with a house. It might just be a mess. But she kept smiling... and eventually we were done. And we built that house. Zoe LOVED it. She was so excited to show that thing to every single person that walked into our door. It sat there on our dining room table for a whole month. You know what? We'll probably do it again next year if Zoe asks. As far as she's concerned it was a fabulous thing to do. But next time? Next time I'm building that house the day before so it REALLY has time to set and dry before the decorating begins. Maybe that will help? If not... we always have a hammer.